This sugar free fig jam is fast becoming one of my favourite things I have ever made. It's easy to make, has just three ingredients and has absolutely no added sugar. Yesterday I made Apple, Oat & Ginger Pancakes and spread this delicious jam on top. It also tastes very yummy on apple and fig flap jacks. I am lucky enough to have fig trees in my garden, so I spent a few hours with my trusty Arthur Cat pottering outside and picking figs to make home made sugar free jam. Each Thursday I send out Feel Good Foodspiration, Happy Eating Encouragement & Peta’s Food News all wrapped up in one little mail full of love. I’d LOVE to receive the next Feel Good Foodspiration on Thursday! I’m so excited and grateful that you’d like to hear from me each Thursday. I can’t wait for you to read this week’s email! This sugar free fig jam should last for quite a while as long as you have boiled it for a good amount of time and store it in steralised, air tight jars. Below I have written that it will keep in the fridge for 3 weeks. Only 3 weeks I hear you say?! Well, it may last longer! I'm not sure as I give lots away and what I keep for myself is usually used up for breakfasts and in baking within 3 weeks. 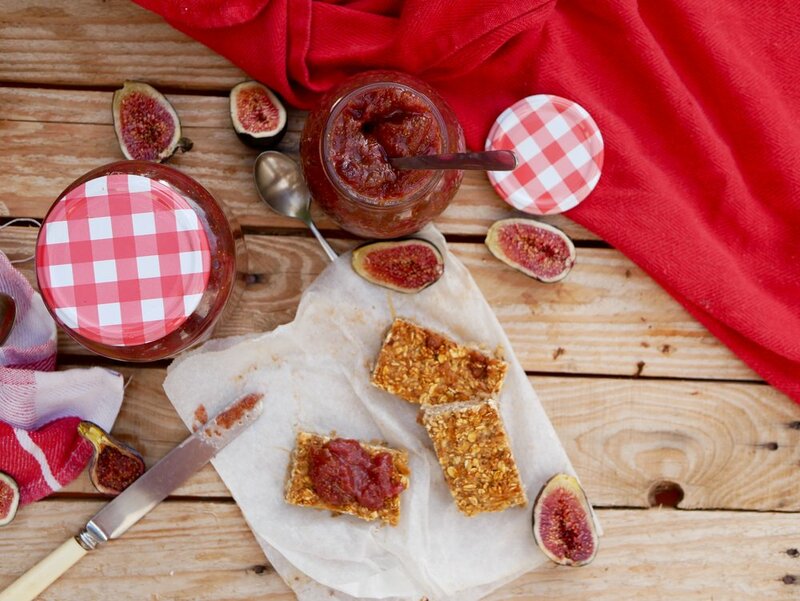 A super simple jam made using just 3 ingredients with no added sugar. Wash the figs and cut the stalks off. Cut into quarters, leave the skin on - it's full of goodness! Pop the figs into a large saucepan and cover with the 400ml of water. Bring to the boil on high for 5 minutes. Simmer on medium heat for 45 minutes and stir occasionally. The figs should break down and make a lovely jam. Stir in the lemon juice once you have taken the pan off the heat and leave to cool. Sterilise the jam jars by placing them in the sink and pouring boiling water into each one. Let the water run of the top to sterilise the very edge of the jar. Be sure to also sterilise the jam jar lids too with boiling water. Be very careful!! Once cooled a little, spoon the jam into the jars and leave to cool fully. Keep the jam in the fridge for up to 3 weeks.